The advertisement provides an illustration of a particular utopia, a corporate dream of the urban as a bundle of transportation networks that optimize the efficient exchange of objects and things. Meanwhile, it seems that Google might benefit from similar quasi-philanthropic research mergers as its seeks to irrigate [ever broader] territories with [logistical] potential (*). The company has run into problems installing its new “super-speed” internet project in Kansas City. The design problem concerns how its fiber optic cables are to be physically hung from existing utility poles within the city. 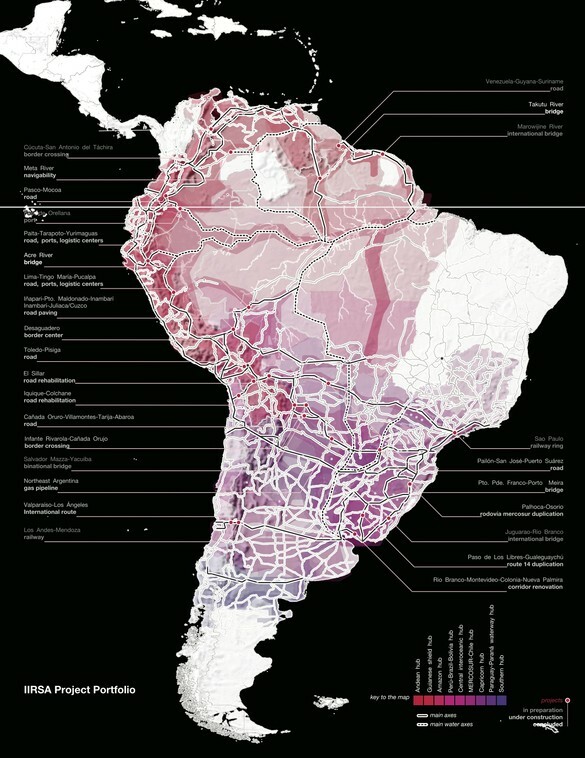 Chasing the IIRSA project is the The South America Project, a coalition of South American designers researching the potential effects of the IIRSA proposals and testing alternative design scenarios for the continent’s emergent infrastructure. In the most recent Terragram interview, we encounter another type of logistical design coalition. Here designer Casey Brown talks about his research interest in the “meta” or “macroscopic” landscape, by which he means the larger physical patterns and forces acting upon a region, nation or collection of affiliated landscapes. In the course of the interview, Brown is asked if there is a risk of his macro data mining and statistical distillations (what he generates as senior researcher for P-Rex) to be manipulated or “data wrangled” to suit proprietary and institutional desires. Interviewer Craig Verzone asked this question based on Brown’s description of his current work for Toyota, a client who came to P-Rex for logistics consultation, a selection based on reading their urban diagnostic research published in Drosscape. Rather than the designers chasing a received or pre-formatted agenda, clients and corporations are coming to them based on the agendas revealed through proactive research questions. Quite arguably, P-Rex has succeeded in generating disruptive hypotheses and subsequent business singularities. Yet at the same time, Brown acknowledges that although it is better to be in on these conversations rather than outside them, he admits that “we cannot control data or what they do with it”. Thanks to R. Holmes and S. Becker for conversations leading to links within this post.